Actual use of BIM for 3D collision detection has not changed in 8 years. People continue to anticipate using BIM for 3D collision detection more in the future . . .
. . . But their expectations are not as inflated as they were in the past. Complete results from the survey in 2010, 2011, 2012, 2013, 2014, 2015, and 2016 are available online. Let’s first look at the specific use of BIM for 3D collision detection. 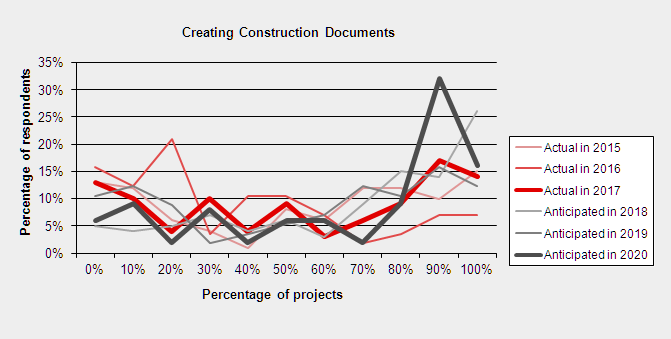 Each year we ask what percentage of projects use BIM for 3D collision detection. This first graph shows the current use of 3D collision detection for each year since 2010. The shape of the line is largely unchanged from year to year. The overall use of BIM for 3D collision detection has remained the same for the last eight years. The next graph shows the expected use of 3D collision detection in the future for each year since 2010. The percentage of respondents who thought all of their future projects would use BIM for 3D collision detection was around 30% for the first three years of the survey (2010-2012). In 2013, that value dropped to around 20% and has stayed at about that value. 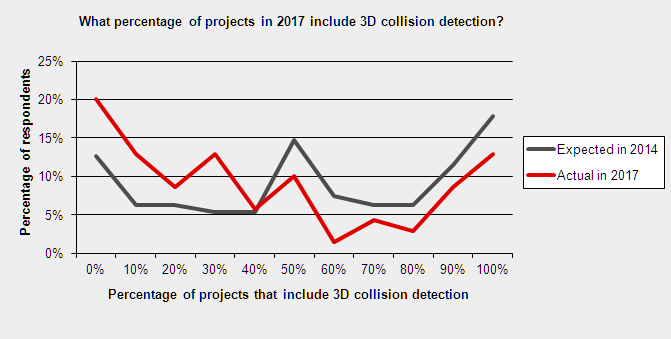 The final graph compares the actual use of 3D collision detection in 2017 with what was anticipated three years ago in 2014. The actual use is lower than what was anticipated. This result is the same as what we have seen the last four years. Fewer projects today include 3D collision detection than people predicted 3 years ago. This result has not changed since we first reported it in 2013. The amount of overestimation has decreased, but that is because expectations for the future have decreased, not because actual use has increased. Actual use of 3D collision detection has not changed. We expect the actual use of BIM for 3D collision detection to continue to remain the same in the future. We have been tracking four uses of BIM since the start of our survey: 3D collision detection, automated design, material takeoffs, and green design. We also have been tracking companies that do not use BIM at all. Prior to 2015, we asked, “Select all the ways your company uses BIM on projects.” We changed the wording of this question a little bit last year. 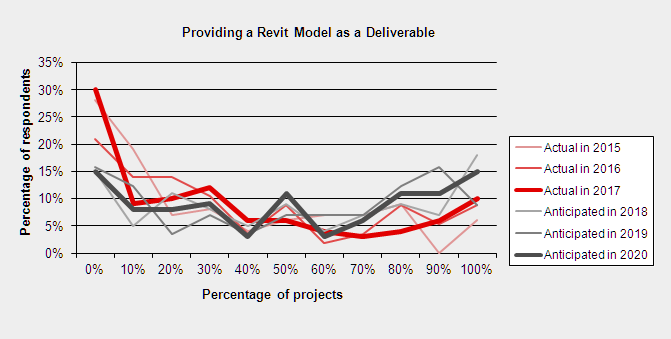 We asked, “Select the percentage of your projects that you use BIM for this specific purpose on projects”. Using 0% as “no” and anything else as “yes”, we are able to compare all the years. The change in wording caused a significant jump in the use of BIM for material takeoffs and green building design. 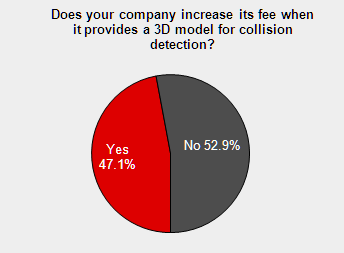 The use of BIM for 3D collision detection appears to be fairly stable over the past eight years. 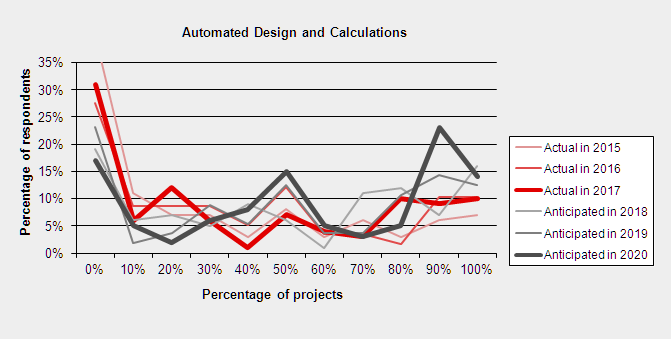 The use of BIM for automated design appears to have increased. 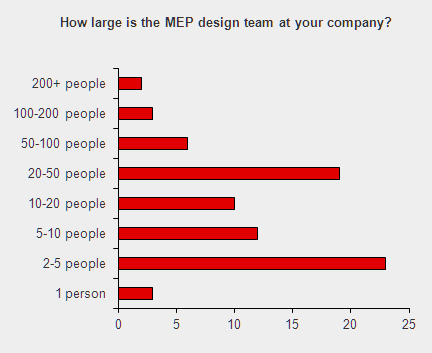 Next, we have a snapshot of all the ways people are using BIM for MEP design this year. These questions were new two years ago. With three years of data, we can start to see trends for these uses, but there is not enough data to support any strong conclusions. Next year we will get to compare predictions from 2015 with the actual results in 2018. When looking at these graphs, you want to look for trends in the group of red lines and in the group of grey lines. Any BIM On a Project: We intentionally did not define BIM for this question. It was left up to the respondent to decide what “BIM” meant and whether it applied to their projects. The use of BIM compared to last year appears largely unchanged. There is some expectation of increased use in the future, but not much. Automate Design and Calculations: This use of BIM should not depend upon anyone else on the project using BIM. You can size a duct, a feeder conductor, or a pipe whether or not the architect or structural engineer provides you with their model. This use is one where every project could benefit from BIM. Actual use does not appear to have changed. There is some expectation of increased use in the future. Construction Documents: This use of BIM also should not depend upon anyone else on the project using BIM. Having a model from the architect should help, but it is not necessary. This use is also one where every project could benefit from BIM. This use fell last year but bounced back this year. There is some expectation of increased use in the future. 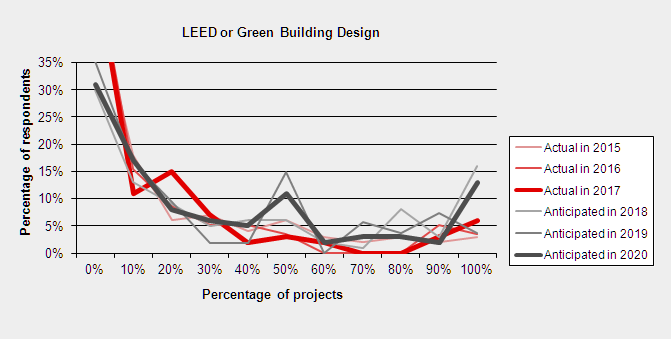 Green Building Design: Green building design is a hot topic, but not a very common use for BIM. Most green design is about design choices (daylighting of rooms or choice of mechanical equipment) that BIM cannot help the engineer with. Once the choice is made, BIM can be used to model it, but there is no magic “make my building green” button. This use is unchanged from last year. The expectation of future use is close to current use. Revit Model: Revit is a specific implementation of BIM. It is often requested by specific companies and government agencies as a final deliverable for a project. Other Uses: We also asked about the use of BIM for material takeoffs, simulation and animation, and prefabrication. None of these uses appear to be very popular. 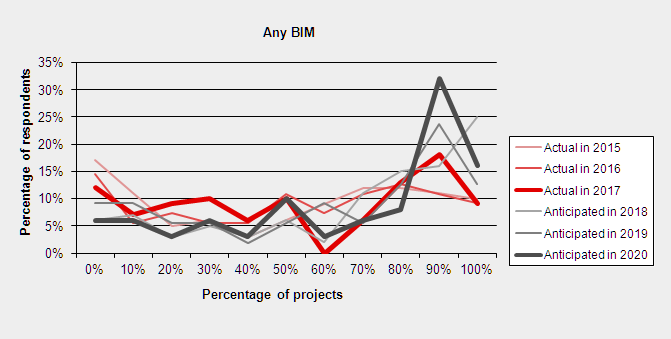 Most respondents do not use BIM for any of them. 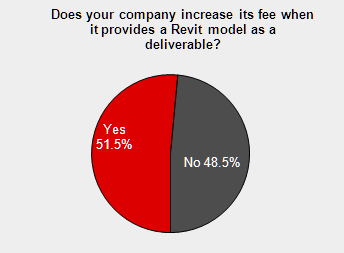 Fees: Finally, we asked whether respondents charged more when asked to use BIM for these various purposes. These values have not changed in the last three years. For most uses, most people do not increase their fee. The two exceptions are using BIM for 3D collision detection and using BIM to deliver a Revit model. Both of these uses of BIM require additional work from the MEP engineer or designer that does not directly benefit them. Respondents are split between whether they increase their fee to provide these services. These results are based upon 68 respondents from the United States and Canada. The handful of respondents from other locations were filtered out of the results. 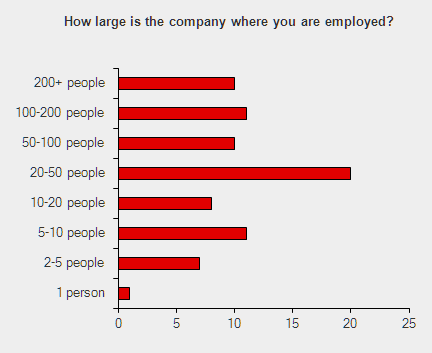 The following graphs show the size and types of the companies where respondents work. Most of the respondents work at large companies. 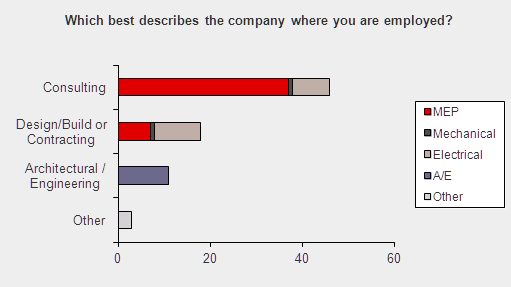 Most of the respondents work at consulting companies. The number of projects that use BIM for 3D collision detection has not changed in eight years. The use of 3D collision detection in the MEP industry is stable and is unlikely to change in the future. Projects that benefit from 3D collision detection are already using it. Projects that do not currently benefit from 3D collision detection are unlikely to start benefiting from it in the future. Last year, our hypothesis was that the other uses of BIM are also stable and will not change in the future. We think other uses of BIM are like 3D collision detection. BIM software is mature enough today that if BIM is going to help on a project, it is already being used on it. If BIM is not going to help today, it won’t help in the future. The use of BIM in three years will match the use of BIM today. Based upon our results from our new questions so far, it appears likely that this hypothesis is correct. We will know more as we continue to run the survey in future years.